The first general-interest biography of the legendary editor of The Jewish Daily Forward, the iconic Yiddish-language newspaper of the laboring masses that inspired, educated, and entertained millions of readers, helped redefine journalism during its golden age, and transformed American culture. Abraham Cahan took the helm of a failing Yiddish Socialist daily in New York City in 1902 and over the next fifty years turned it into a national newspaper that changed American politics and earned him the adulation of millions of Jewish immigrants and the friendship of the greatest newspapermen of his day, from Lincoln Steffens to H. L. Mencken. Cahan--whose tenure at the Forward spanned the Russian Revolution, the First World War, the rise of political Zionism, the Second World War, the Holocaust, and the creation of the State of Israel--did more than cover the news. He led revolutionary reforms--spreading social democracy, organizing labor unions, battling communism, and assimilating immigrant Jews into American society, most notably via his groundbreaking advice column, "A Bintel Brief." Cahan was also a celebrated novelist whose works are read and studied to this day as brilliant examples of fiction that turned the immigrant narrative into an art form. Acclaimed journalist Seth Lipsky, creator of the English-language successor to Cahan's Forward, gives us the fascinating story of a man of profound contradictions: an avowed socialist who wrote fiction with transcendent sympathy for a wealthy manufacturer; an internationalist who turned against the anti-Zionism of the left; an assimilationist whose final battle was against religious apostasy. 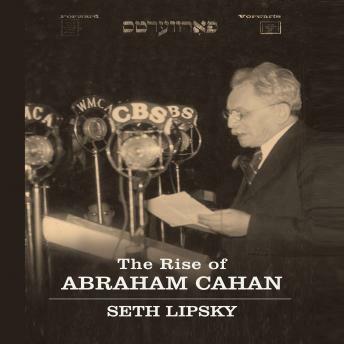 Lipsky's Cahan is a prism through which to understand the paradoxes and transformations of American Judaism itself. A towering newspaperman in the manner of Horace Greeley and Joseph Pulitzer, Abraham Cahan revolutionized our idea of what newspapers could accomplish.